I finally got the photos I wanted in order to share our visits to several Hari Raya Open House events (end of Ramadan). In fact, we chose to go back to Malaysia during this period so that hubby could experience some Raya celebration atmosphere, which he absolutely enjoyed. I realized that the "Open house" concept is something very unique to Malaysia. It doesn't exist in France and I'm not sure if it exists in other countries. Basically, many politicians / agencies / individuals invite the public to their house / place to celebrate events such as end of Ramadan, Chinese New Year and Deepavali (Diwali). I told hubby that he could even go to see our Sultans if he wanted. My family tried to look for celebrations that could suit our schedule. The first one was an invitation to a coworker's house. We went with my brother in laws, and we had the warmest welcome from the couple. They were from Sarawak (a state in East Malaysia in the Borneo Island), so they prepared the Sarawakian noodles for their guests. The garnishment for the noodles. Dessert: Kuih lapis (layer cake). The host told us that it took her 8 hours to finish baking all of these. Thanks a lot to the couple, I hope they are going to join the parenthood soon.Thanks also to my brother in laws who took the time to bring us there. The second venture: we were invited by the police department, not for felony but celebration. We were greeted by several police officers, dressed in their finest traditional clothes. There were so many food stalls that we didn't know which one to start with. Hubby tried their "Kari Rusa" (deer curry) and was so impressed. As for me, I queued for the satay and ice kacang. Their fried kuey teoh was very good too. Thanks to my sister's connection we got to sit at the VIP area and enjoyed different scrumptious Malay dishes. 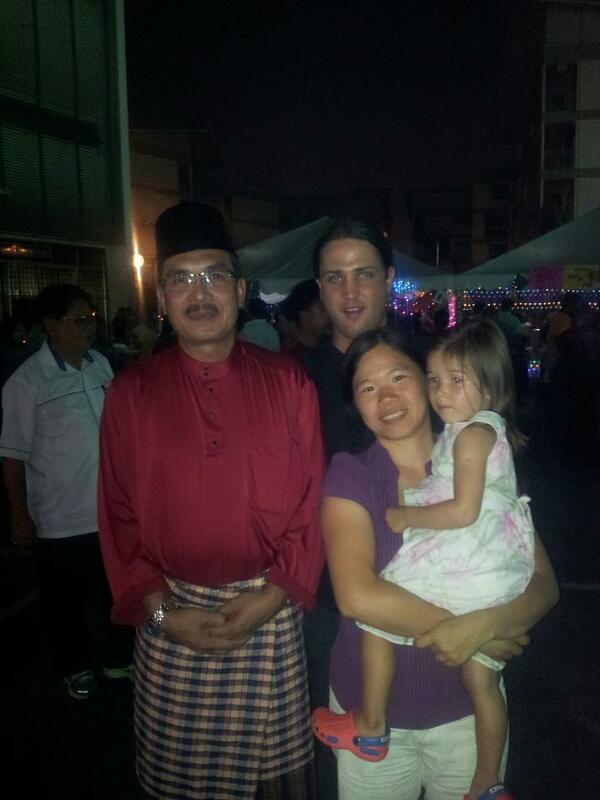 We got also a chance to take photo with the big chef of the police department. And Aelig got to meet the cutest girl of the night. 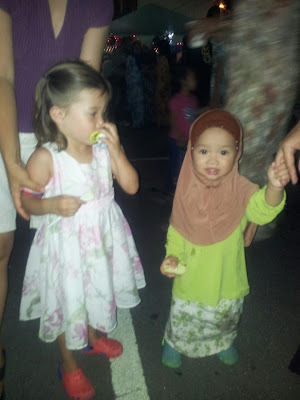 Isn't she adorable in her baju kurung (one type of Malay traditional clothes)? We went to the third open house organized by the Motorbike Association, also through my sister's connection. Unfortunately, my camera broke down when we were in Krabi, so we didn't take any photo. But I surely remember the kindness of the hosts and the authentic Rendang curry. Wow.. this is truly Malaysia!! real hospitality.. I have never been to any of the open house myself.. i will definitely tryt hat next time.. for some real rendang..